After enjoying the freedom and downtime of summer vacation, it can be hectic and chaotic trying to get everything organized as you prepare to send the kids back to school. Whether you are repurposing an existing space or planning a room addition these Back-to-School organizational methods can help you have an A+ school year. Back to school means back to routine – and back to entryway clutter and morning chaos. The end of a long day of school and extracurricular activities can be hard. If there’s not a convenient place to put backpacks, shoes, and jackets, they’ll likely end up on the floor. The next morning you’re faced with finding backpacks, homework, and missing shoes, all before rushing out the door to start all over again. Consider using these entryway organizational tips to help kill the clutter. electrical outlet nearby, install a charging station or basket so everyone’s devices are charged and ready to go in the morning. This also keeps the kids – and adults – from staying up late playing on their phones. Back to school also means back to the daily influx of paperwork. Notices, calendars, permission slips, and homework all come home each day. If you let them pile up, you’re sure to miss an important newsletter or announcement. Work on developing an organizational plan before the school year begins. The entryway is a great place to store and organize paperwork as it comes in. Consider hanging some file folders on the wall for paperwork that needs action. As it comes in the door, quickly sort it into folders so you don’t miss a thing. The entryway is also a good place to keep track of your family’s calendar and schedule. Hang a bulletin board, dry-erase, or other calendars on the wall, and write all the family’s appointments and school events on it. This will help keep everyone organized and on track all year long. It’s also a good place to write reminders and hang messages for family members. This way, nothing gets missed or forgotten throughout the week. A mudroom is another place that gives busy families a place to easily store things like shoes, coats, backpacks, and sports equipment. It is a great staging area for coming and going. It is also a convenient place for taking care of things like laundry and recycling. make it easy to deal with outdoor wear when you’re coming and going, and shoe shelving encourages everyone to take off their muddy, wet shoes before traipsing through the house to put them away. Built-in lockers or tall cubbies are a popular choice. They provide each member of the household with shoe storage, coat hooks, and high shelving for items of all shapes and sizes. Baskets are also useful for containing and concealing clutter. Utilize closet space to help store and hide seasonal or less-used items. 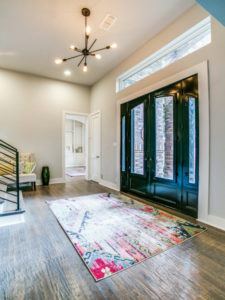 Since a mudroom is generally situated near the doorway everyone uses to enter and exit, chances are people will come in with messy hands from time to time. A utility provides a convenient place to wash up. It also aids in gardening, laundry, and other tasks where water is needed. Speaking of washing things, a mudroom can also double very conveniently as a laundry room. Consider making your laundry room the family’s main entrance to the house. This makes it simple to drop off soiled sports clothes, wet winter wear, dirty socks, and other items that should be washed sooner rather than later before they have time to dirty up another area of the house. If you’re storing shoes in the mudroom, it’s a good idea to provide somewhere to sit while people are taking them on and off. Include a built-in bench for a sleek, modern look, with drawers or cubbies underneath to make sure no potential storage space is wasted. This serves multiple purposes for everyone and helps keep your mudroom clutter-free. It’s important to have a separate space designated for studying in order to reduce distractions, especially when getting back into the school routine this fall. In order to help you or your children remain focused for an extended amount of time, your study space should be comfortable and clear of clutter. your workspace. Add bookshelves or other small shelving units around the room for storing and organizing things like books, pads of paper and chargers. Utilizing storage in your study can help you focus, keeping your workspace clear and your mind clearer. As you are maintaining the cleanliness of your space, have fun making it your own. Utilize your wall space by hanging artwork or pictures. Add pops of color, a comfortable chair, and strategically place your furniture to make it interesting and fun. Just a few small details can make your study a space that you enjoy spending time in. Don’t have an attic space? Get creative! Our design-build team can help you find unused spaces that you can transform into just what your family needs. Making sure your laundry room is organized and clear of clutter is crucial in the midst of back to school chaos. Sports gear, school uniforms, and day-to-day clothing pile up faster than you can keep up with. It’s important to have a good laundry routine and adequate storage space for both clean and dirty laundry throughout the week. 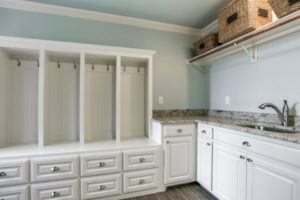 Storage is one of the most overlooked elements in a laundry room. It is also one of the most important. Set aside some cabinet space to hold all of your cleaning and laundry supplies. This helps keep everything in one, easily accessible place without crowding other areas of the room. Shelves are great for storing things like clean towels, sheets, or folded clothes that still need to be taken to the closet. member of the family a laundry basket in their room so that they can periodically bring their dirty clothes down and sort them. Pre-sorted baskets make doing laundry easier for everyone. Encourage everyone to throw their dirty laundry in the baskets, not on the floor or countertops. Making sure you have a counter or other surface space available to use will streamline your laundry routine. This gives you space to sort, iron and fold all in the same, convenient place. Keep the surfaces clean and clear, ready to be used in a pinch. 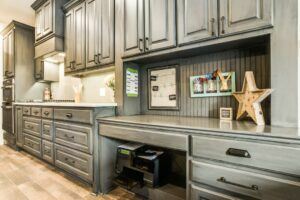 If you don’t have any counter space in your laundry room, consider building or purchasing a table or island that can be moved or put away when needed as a simple, easy alternative. 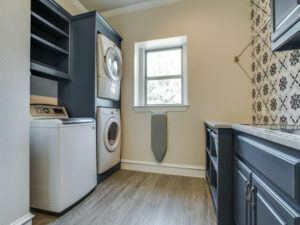 A laundry room that can accommodate a rod for hanging clothes will make the chore a lot easier. Permanent press clothing, such as dress shirts, can be hung on a hanger immediately after coming out of the dryer, without requiring a special trip to the closet to be put away. Hang articles of clothing that need to air-dry, or simply use this space to hang up your clean, dry clothes before they go into the closet. Having a hanging rod in your laundry room serves multiple purposes and helps you save time and energy. schedules in your life. With some simple organization, this year’s back to school transition can be easy and clutter-free. Consider the space you have and your family’s needs when planning, to make sure space gets used efficiently. Encourage the kids to put everything where it belongs each night so that everyone can enjoy a hassle-free morning. With some simple organization, this year’s back to school time can be easy and clutter-free for the entire family. Is it time to make some changes? Tell us about your project and get a free estimate.